There are no small projects, but some have a slighter scope. Here is a sampling of projects that consisted of a piece or two, as well as a few favorites from my days at the Massachusetts College of Art & Design. The Puppy Rescue Mission, Inc. is a 501c3 charity that fund raises and assists in pet rescue, foster and re-homing. The organization particularly focuses on the pets of soldiers, especially those deployed in war zones. They also work to help our soldiers bring their companion animals home from war. The founder of The Puppy Rescue Mission approached me to design a unique, youthful unisex graphic to be used on merchandise to raise funds during their events and in their online store. I was especially keen on their slogan; and loved putting away the computer for a while to hand letter this design. 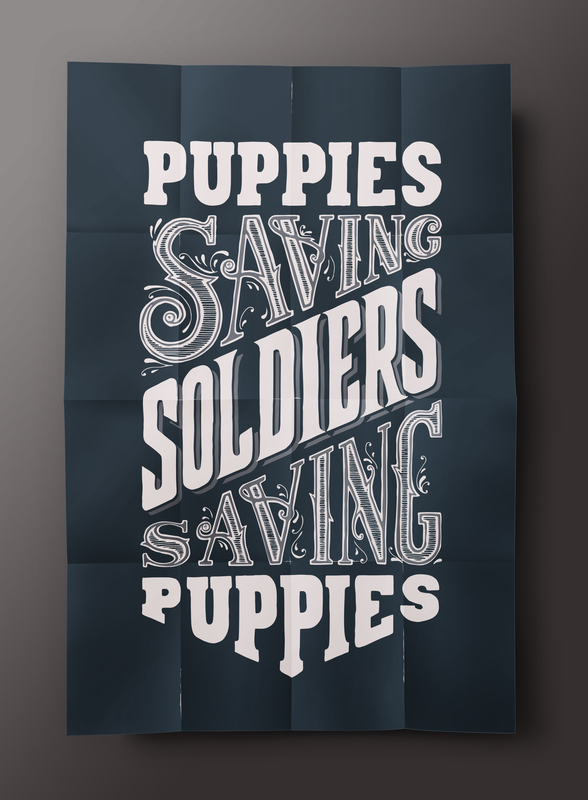 Plus, who doesn't want to help save some puppies? Continuum is a global innovation and design consultancy. For three decades, the company focus has been to help organizations drive business innovation through the design of products, services and experiences that become part of the fabric of people’s lives. From advertisements, banners and invitations I was tasked to create a wide range of materials which all spoke to Continuum’s inspiring innovation and business savvy. An invitation to Continuum’s Design Thinking workshops which offers a chance to understand the basics of design thinking and the ways it bridges business and design.